iLoveToCreate Blog: Tulip ScreenIt: Everything you need to know! Tulip ScreenIt: Everything you need to know! Click here to see the exclusive Tulip ScreenIt site. 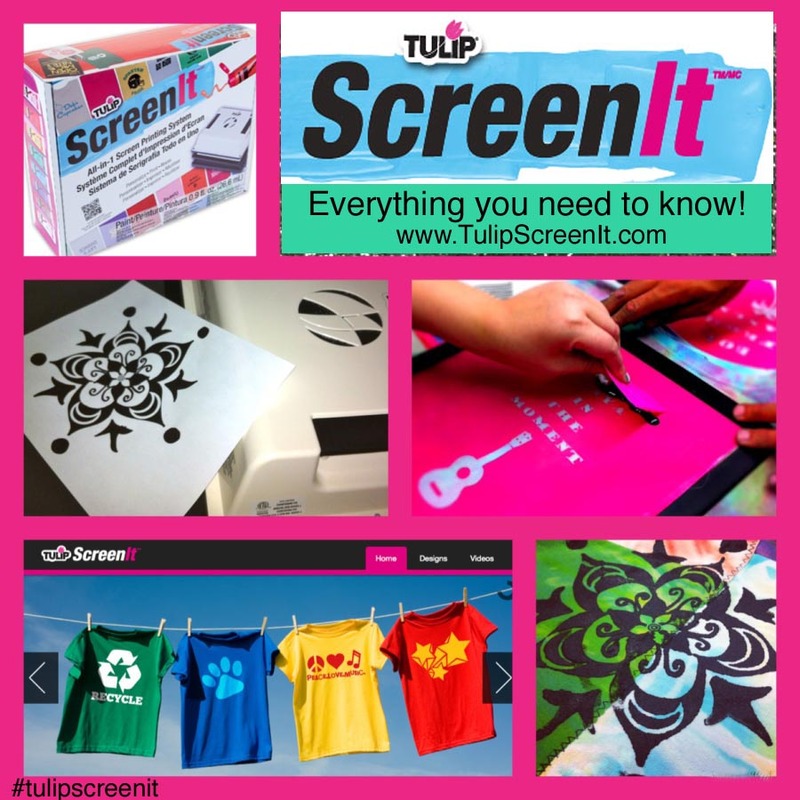 We are super excited over here at iLoveToCreate because we launched the new Tulip ScreenIt machine! Just like a sewing machine and a glue gun, we feel this is a must-have tool for every crafter, artist, designer - not to mention moms, teachers, business owners, etc. Anyone who has ever wanted to easily silkscreen their original images far and wide - we thought of you while designing this system! This machine is lighter than a sewing machine and is very portable. It comes with pre-emulsified screens, that you burn your design into with an image printed or drawn onto a sheet of lightweight copier paper. Once your screen is burned, you simply rinse it, let it dry and then use the machine's base to slide under your surface so you can add your favorite Tulip Soft Paint color. Okay, that is the simplified version. But it really it is very easy to use! We have an entire website dedicated to all things ScreenIt, so you can learn all you need to know! - Frequently Asked Questions and even our in-house designers' tips! Are you excited? What would you like to make with a Tulip ScreenIt? Leave a comment below and let us know! How much does it cost? Can not find pice anywhere. It ranges from $129-$149, depending where you buy it! Screenprinting's come a long way from my day! Is it going to be available in the UK?? I have been looking at the Screenit and everywhere I look it has horrible reviews, Especially about the burn time. Is there anything being done about fixing the machine? I bought one yesterday and tried it out today unsuccessfully. I have not been able to find many successful examples online. My first screen was underexposed I think- the design did not wipe away in most areas- I burned it for 15 mins. I tried the second for 16 mins, as the tulip website recommended (although the printed instructions say not to go over 16 mins!) and some was overexposed- areas beyond my design wiped away. But yet half of the design still did not wipe away. I am nervous about spending another $20 to buy another screen and try again. I'm very disappointed and wish I had read the reviews before purchasing. I just picked up one of these and immediately realized why people are not able to solve the problem of underexposure. That's because you're not under-exposing.. you're OVER exposing. If the pink sheet never sees light, it will wash out completely. Putting the sheet into the light box HARDENS the emulsion. So if your design isn't showing up, you've already overcooked the emulsion. the lamps may be too bright. (new lamps often have to be burned in for an hour or so before the light level and color temperatures stabilize) Or, if you're a dummy like me who knows that 'real' print shops use vellum or clear acetate sheets for their artwork .. these allow the light box to completely TOAST that emulsion in about 30 seconds! That sheet will be so cooked that even steel wool won't get you any clear areas. So remember.. clear = underexposed or unexposed. That's what you want, because that's the part that the ink will pass through. It comes from the black parts of your artwork because the black blocks the light from cooking the emulsion. Opaque means that part was exposed to the light and it hardened the emulsion. That part comes from the 'white' areas of your original. No ink will pass through those parts. They become your mask. I notice the host of the site has no answers for the complaints. We appreciate your comments & would be happy to answer specific inquiries or troubleshooting on our LiveChat at iLoveToCreate.com or toll free at 1.800.438.6226.